British Council ELTons - English Online Inc.
We have some fantastic news to share with you today! Join us in celebrating the international recognition and success of our first Summer EAL MOOC. 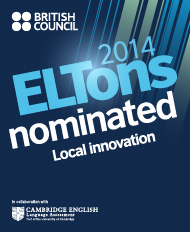 English Online has been nominated for this year’s British Council ELTons awards. Being “the Oscars” of the teaching world, the ELTons are the only international awards that recognize and celebrate innovation in the field of English language teaching. Since 2003, English language teachers, schools and publishers from around the world can apply for this prestigious recognition. Our summer program has been nominated in the category of local innovation. English Online’s Summer EAL MOOC is a 9-week English course for immigrants to Manitoba. Its purpose is to provide a flexible learning environment for English practice and community networking, along with an introduction to summertime life in Manitoba. The complete facilitated course was first offered by English Online in 2013. So, will you be rooting for (=cheering on) English Online to win? Tell us your thoughts on our Discussion Board.